The dynamics of a French show are different. Despite getting in very late indeed my friend and I passed through the crowd with ease and ended up very close to the stage. In Britain standing in front of the stage would lead to a sort of wrestling match as you struggle to hold your position amidst the crush. But here there is room to move and, importantly, dance. 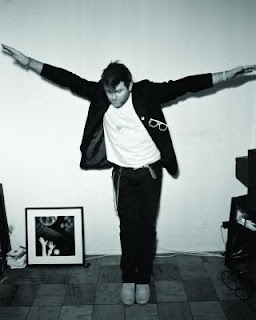 And dance we do, for in a live environment LCD Soundsystem particularly excel when they air their more electro-based tunes – the crowd erupts during the triple salvo of first album favourites 'Tribulations', 'Movement' and 'Yeah'. The repetition and polyrhythm in the music shine, and lend the performance a tribal quality at these moments. Having said that, less hectic songs of the night still work well. This is partly thanks to the intimate nature of the venue: despite its 1500 capacity, there is no barrier between the stage, so the subtler moments manage to retain their emotional resonance. This lack of barrier means that a stage invader is allowed to stumble around for a while before being gently ushered back into the crowd not by a bouncer, but by the group’s guitarist. To show there are no hard feelings, Murphy leans into the audience and shakes his hand. Some new songs are aired, but the gig as a whole, with a liberal smattering of tunes from each of their three releases, is a reminder of just how much strength in depth the LCD Soundsystem output has. Murphy tells the audience apologetically that this is the last night of the European leg of their tour and that his voice is struggling, but it holds up well throughout, not least in set closer 'New York I Love You', which features an acapella breakdown in which he and his keyboardist Nancy Whang sing a little of the chorus to 'Empire State Of Mind'. This comes at the end of a strong encore, with 'Someone Great' and 'Losing My Edge' preceding the aforementioned adopted-hometown homage. The crowd cheer wildly as Murphy uses the only French word he seems to know to thank them. But in the presence of such excellence, nay, greatness, it is surely the crowd who should be saying merci. STREAM: LCD Soundsytem - Tribulations For more on the band, go to their website.